E&O is currently funding the land reclamation almost entirely by borrowings. Last year, the property developer raised RM1 billion in syndicated facilities from Maybank Islamic Bhd and RHB Islamic Bank Bhd. But the borrowings are not enough to fund the land reclamation. Furthermore, given the long gestation period of the project, relying on borrowings alone might not be sustainable. E&O could not be reached for comment at press time. It is not known what would be the valuation of the land reclamation project. E&O is on a lookout for a deep-pocket investor and this is quite an open secret in the industry. It had also been reported that the property developer intends to have an investor willing to acquire 40% stake in the project. 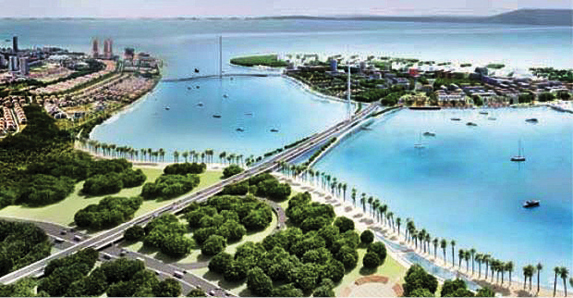 China Communications Construction Co (M) Sdn Bhd was contracted to undertake the land reclamation last year. The entire STP Phase 2 encompasses land reclamation of up to 760 acres under E&O’s concession. Phase 2A only makes up one-third of the reclaimable land. Last year, the expiry for E&O to undertake the land reclamation was extended from 2019 by three years to 2022. The project was originally approved by the state government back in 1992. For the nine-months ended Dec 31, 2016, E&O posted a cumulative net profit of RM38.14 million, down 26% year-on-year from the previous year’s corresponding period. The company has a net debt of RM1.2 billion and a net gearing of 73.65% as at Dec 31. Yesterday, E&O share price climbed further to close at RM2.12 — the highest closing since March 2015 — up 16 sen or 8.2%. Trading volume swelled to 10.5 million shares. The property has rebounded from the low of RM1.40 in late December.